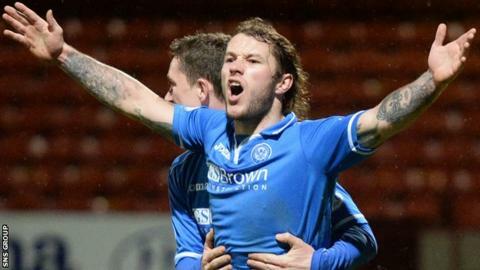 St Johnstone's Stevie May is the Scottish Football Writers' Association young player of the year. The 21-year-old striker has scored 27 goals for the Perth side this season. "Obviously it's nice to get recognition personally, but this is really an award for the whole team. I couldn't be young player of the year if I didn't have great guys round about me," he said. "St Johnstone have had an outstanding season, so it's credit to the players and the manager as well." Saints host Premiership champions Celtic on Wednesday before bringing down the curtain on their league campaign away to Inverness on Sunday. Then May and his team-mates can look forward to the club's first ever Scottish Cup final, with Dundee United their opponents on 17 May. St Johnstone have sold more than 14,000 tickets for the Celtic Park tie and local lad May is delighted by the response. "It is a final for Perth and not just the club," he said. "It's refreshing to see so many people encouraging the team. "It's a massive occasion, not just for the players and management, but for everyone. The fans have waited too long for this occasion - 130 years - and the ticket sales have been incredible. I don't think anyone expected it to go as well. "I've been asked for a few tickets, but most people I know can get them easily. A lot of the boys have a bus going from where they are from. There is a bus coming from Newburgh, where I'm from. "Somebody I used to go to school with is coming all the way from Australia. It just shows how much it means to people. If we were to go that bit further and win it, I couldn't imagine how it would go down in Perth and the reception we would get. "We almost had full houses for the European games too and it shows you the fans are there. It's up to us to show them we are worth coming to watch week in, week out." Meanwhile, May expects talks over extending his contract beyond the end of next season to continue soon. "We have massive games and that's my focus, and we'll look to get that sorted whenever it may be," he said. "It's not something that gets sorted overnight." May was nominated for the PFA Scotland young player of the year, with that award going to Dundee United full-back Andrew Robertson.